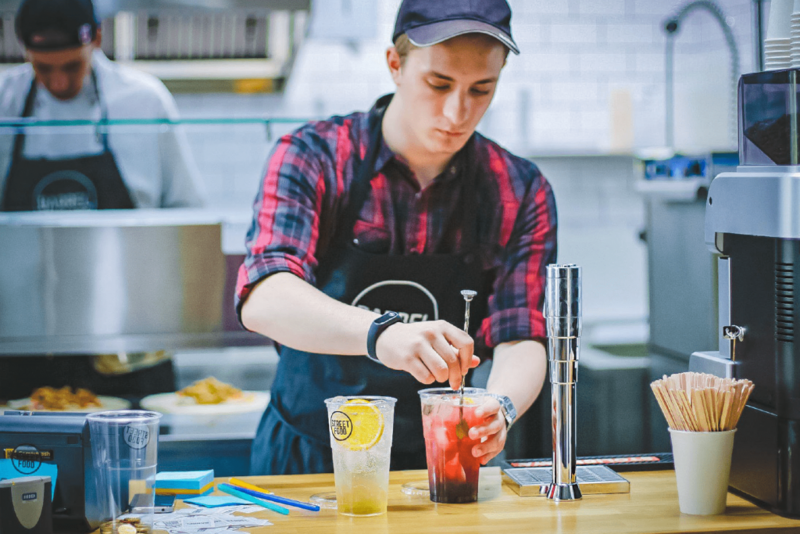 Business owners that operate in the retail, food services, and hospitality industries have 7 months to prepare for Oregon’s predictive scheduling regulations. While municipalities throughout the country have passed city ordinances, Oregon is the first state to adopt predictive scheduling requirements. With the signing of Senate Bill 828, employers state-wide must prepare for the substantial changes that are soon to take effect. The new law will impact employers with 500 or more employees worldwide and counts subsidiaries and their parent companies as a single employer. This broad definition ensures that the largest number of employers will be impacted by the changes and, furthering this goal, the hospitality industry includes casino operators. Most of the bill’s provisions are activated on July 1, 2018, but some regulations will become more burdensome at a later date. For example, employers will be initially obligated to provide at least 7 days of advance notice of workshifts to an employee. By 2020, however, business will be forced to give employees 14 days of advance notice. For every schedule change made within this one (and eventually two) week window, employers are obligated to pay employees one hour worth of wages to the employee in question. For employees working in a state with one of the highest minimum wages in the country, this could become a bounty–for employers this could become a dangerous burden. Employers are encouraged to avoid scheduling employees within a 10 hour “rest period” of their last shift, and employers that choose to schedule employees during this period must pay them 1.5 times their regular rate of pay. Businesses must also receive written and voluntary consent in order to schedule employees in this manner. Like many other predictive scheduling laws, the Oregon legislation requires employers to provide a good-faith estimate of the number of hours an employee can expect to work in a given period. In this case, that period is one month. Employers must also explain their voluntary on-call list procedures and cover the employee’s tentative work schedule. This estimate must be given to all new employees at the time they are hired. Unlike some other examples, the Oregon version of predictive scheduling does provide employers with some leeway in the area of on-call shift. Businesses can ask employees if they would like to be on a “voluntary standby list” and if an employee consents, the employer is exempt from a number of potential scheduling penalties. Additionally, employees hired to fulfill an administrative position such as a secretary are exempt from the requirements. Employers are subject to penalties for every violation of the law’s provisions and record-keeping is an important part of compliance. Oversight is handled by the Commissioner of Oregon’s Bureau of Labor and Industries who has the discretionary authority to levy fines up to $1,000 per violation. It’s imperative that employers covered by this legislation begin to prepare now. They should begin by updating their hiring policies and retrain staff associated with human resources and payroll. Additionally, it would be prudent to begin drafting the necessary good faith estimate templates as well as policies guiding their standby list. Most importantly, employers should reconsider their approach to documenting and recording work schedules. The most convenient and efficient method of doing so would be to use a tool like Deputy. 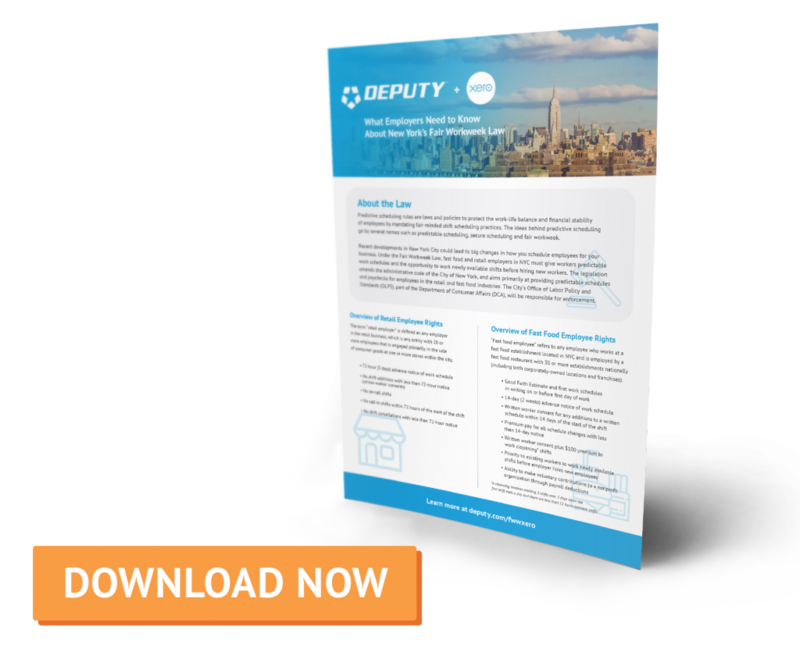 With Deputy, employers would be able to manage their standby list, update their employees’ schedules, and have an electronic record of every important interaction and payroll disbursement. Predictive scheduling is no small matter to adjust to, but if you prepare now and partner with the right employee management system, you can make the transition as seamless as possible. 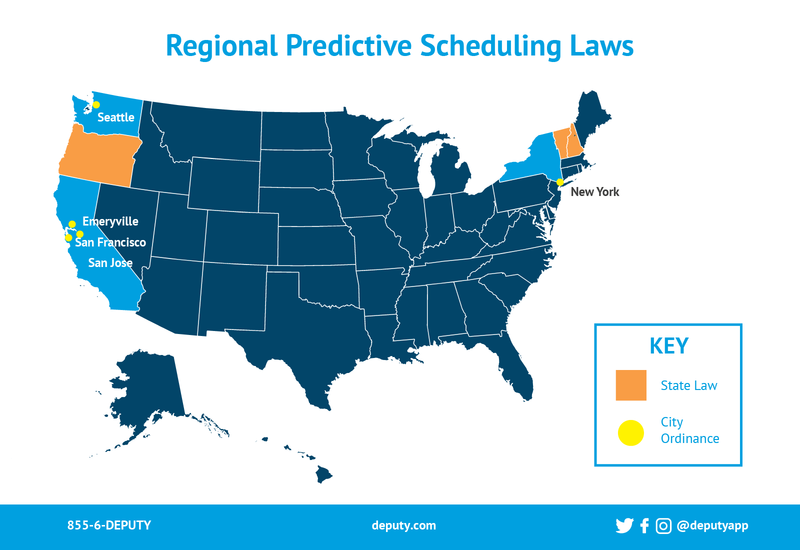 The post No need to predict – here’s how to prepare for Oregon’s predictive scheduling laws appeared first on Deputy. Fast Food and Retailers who aren’t prepared for this law will face steep fines or go out of business. Among 10+ other worker compliance hot topics, these predictive scheduling laws are becoming the new darling for class-action plaintiff attorneys. Small mom and pop shops as well as franchise and powerhouse brands must wake up. The NYC Predictive Scheduling aka the ‘Fair’ Work Week law goes into effect November 26th. Three other districts are implementing a similar law this year: Emeryville, CA , San Jose, CA, Seattle, WA. The entire state of Oregon has passed a law that goes into effect July 1st, 2018 and also targets hotel and motel employers. I’ve also compiled links to the best resources I can find on the NYC Fair Workweek regulation and Predictive Scheduling laws in the other jurisdictions. Derek Jones: Good afternoon, everybody. Welcome to today’s webinar, titled “Latest legal developments impacting New York City’s fast food and retail employers.” This webinar will run approximately 90 minutes, so we have a full action-packed agenda here. Just a couple of housekeeping items. The webinar is being recorded, and we will make the recording available within 24 hours. We will send that email out to you, to all the registrants of the webinar. Please ask questions as we go along. You can do that by just simply typing in the questions into the Gotowebinar panel, and we’ll do our absolute best to answer the questions as we go along or at the end, but, again, we have a full action-packed agenda that will go probably the full 90 minutes. With that we will get going, and I want to introduce the primary panelist for today, Angelo Spinola. Angelo, welcome to the webinar. I’ll let you do an introduction of yourself and then we’ll get diving right into the content. Angelo Spinola: Sounds great. Thank you everybody for joining. As Derek said, my name is Angelo Spinola. I am a shareholder at the law firm of Littler Mendelson, and today we’re going to be talking about some upcoming changes to New York City’s fair workplace legislative package. It’s going to be introduced. Hopefully you are aware of this. Hopefully this is not the first time you have heard about this. The laws will go into effect November 26, so we’ve got about six weeks to get ready, and the purpose of our presentation today is really to get to prepared to make sure that you understand the impact of this legislation, what it means to you, both if you’re a fast food employer or a retail employer. The requirements are more onerous on the fast food side than the retail side, but there’s some separate obligations for each type of employer, so we’re going to cover that. We are doing this presentation with Deputy because we work a lot with Deputy, and, full disclosure, Deputy is a client I work with quite a bit. I’m very familiar with the software. They have, as you will see throughout the presentation, they have the ability to deal with a lot of these changes, and actually handle some of the scheduling requirements, the premium pay requirements, and also I think probably the thing that I like the most about the software is it’s very easy to adjust too. It’s a flexible tool that will allow you to adjust as things change, as schedules change, so you’re going to see some of those features. New York is one of the six jurisdictions that currently have these type of scheduling rules. I think that New York is more onerous than most, so we’re going to talk about what those specific requirements are. We’re going to talk about some client solutions, and our franchise toolkits for those of you that are part of franchise systems that are impacted by these rules. So we’re going to move fast. We’re going to cover more than … the slides actually cover more than what we can cover, but we wanted you to have this information. The slides will be available to you after the presentation, so let’s just get started. The first point that I wanted to cover is generally when you look at the jurisdictions that have been dealing with these kind of scheduling laws, you look at retail and hospitality. These statistics are related to retail and hospitality cases, wage hour cases that have been filed over the last four years or so, and you can see that New York, even before these laws came into place, that New York and California are leading the charge in these cases that are filed. This is only going to increase. We’re going to see more cases as a result of these rules. There is a private right of action due some of the penalties that will apply to you, so the reason I wanted to mention this is a lot of times you can tell what’s going to happen by looking at the past trends. There are some frequent fliers that we see with these cases, and we have already seen them poking around at what these rules are. We can kind of tell you what we think is going to happen there. This kind of breaks down what the cases have been about. When you look at the recent wage hour filings in the state of New York, I think the meal and rest statistic has got to be off because I think that’s probably handled more class actions in New York on meal and rest that what is shown here. I think what this is showing is when the only claim is a meal and rest claim, and what typically happens is you get multiple lawsuits. You get multiple claims, meal and rest, rounding, pay stub violations, a bunch of different things. What is interesting about New York is, unlike in California, most of the New York cases have been filed federally. When you look at the wage hour cases, and we think that’s probably going to change, at least in the city, and we are already seeing that with some of the other city ordinances and laws that have been passed where the plaintiffs’ lawyers are finding that the state court is more friendly than the federal court. We’ve seen that, as you’ll see, later in the presentation with arbitration agreements, with other pay practices, whereas the federal courts in New York are actually more favorable to employers these days than the state courts are, and we’re actually seeing a dichotomy in some of the decisions, with federal courts are ruling in one way, and the state courts are ruling in a different way that’s more beneficial to the employee. What we can expect is that trend will be more states cases filed. This slide just shows you who’s been sued, some of that folks that have been sued. The reason that we like to show this is the best predictor as to whether you’re a target for a lawsuit, and you may be targeted, is if you see that one of your competitors has been sued. So if you’re aware of competitors that are being hit, it is very likely that somebody’s targeting you as well. The reason for that is people stick within the same industry. Employees do. They move around from employer to employer. A lot of these plaintiffs that bring these lawsuits are serial plaintiffs, meaning they keep coming. They’ll bring a suit against one company and then bring the same suit against another company. I’ve got one of those that just landed across my desk the other day, and the plaintiff, the employee, is now on his third lawsuit and he still doesn’t know how to record all the time worked. They kind of figure it out. The other reason that you see it is these plaintiffs’ lawyers, the ones that represent the employees, they know that typically if somebody within an industry is paying in a certain way or has a certain issue, a compliance issue, that many others likely have the same issue because like many industries often do things the same way, and so they develop a strategy and a plan, a formula basically, for litigating a particular issue, and then they continue to litigate that issue over and over, and the only thing that really changes is the name of the defendant. You can see here some of the frequent fliers, and you’ll see in the hospitality and restaurant business, you can see the number of filings that just a few firms have brought. They develop a formula and there’s no reason to change it until and unless the industry changes, so we often refer to the plaintiffs’ lawyers like a swarm of locusts, where they come through an industry, they clean the industry out as much as the possibly can. What really happens is the industry becomes compliant and catches up to what the cases are, the litigation, and then they move on to another industry that would be more low-hanging fruit. It’s easier for them to secure some damages for or on behalf of. What we want to do, and our goal, is to avoid that or move these attorneys away from these industries as quickly as possible and onto something else, and, as you will see, this law really does not help very much. A couple of other firms that are not listed on here that we’re seeing a lot of these days is Virginia and Ambinder, and Fitapelli & Schaffer. You may have dealt with them, but they have had several lawsuits in the fast food business and then also in the retail business. One thing that I wanted to cover on this fair workplace set of laws. It’s five different laws. They were enacted on May 30, 2017, to go into effect November 26. I’ve been studying these laws a lot lately, and one thing that really occurs to me is there wasn’t much representation on behalf of the industry when it came to lobbying and commenting on these laws. When you look at who was behind it, you’re talking about unions. You’re talking about employee association groups, the SEIU was very involved, and there really wasn’t much of a voice on your side of things, and I think when you see what some of the requirements are, they’re very surprising, and they’re the types of things that you would have thought if all voices were heard would have made it different, and some of these things would have been written out of the law, particularly on the fast food side. I was just very, very surprised. Basically in a nutshell, what this law is doing is it’s requiring you to pay a penalty for scheduling changes, and those changes, even if they’re in favor of the employee, you’re going to have to pay a penalty for making those changes, and some of what we see in New York City is different from what we’ve seen in the other jurisdictions. That’s a direct quote. I don’t know if that pisses you off, but it pisses me off. That’s the kind of message … and I read an article that was about eight pages, and it was just filled with this kind of commentary, and there really wasn’t a voice on the other side, so I would encourage you, to the extent this doesn’t already exist, to look at building a coalition, doing something where you’re not just reacting to these laws, and we’ll get into the specifics of the law in a minute, but I think it’s important that as an industry you band together. We do this all the time with other industry groups and other situations. Home care is an example in New York where we built a coalition, and you’ve got to be ready, willing, and able to fight back on some of these laws, and this isn’t the only one. We talked about how New York City now is more liberal than the federal court and more active with legislation. That New York City has its own paid sick leave laws now, and they’ve already collected more than $5 million in penalties for those who have violated those laws. They’ve got an act called The Freelance Isn’t Free Act that applies to independent contractors that doesn’t allow you to use arbitration [inaudible 00:13:26] class waivers in an independent contracting situation. They’ve got that law that you may be familiar with where you can’t even ask now in New York City what somebody’s prior salary was when they’re applying to work for you, and that’s under the auspices of equal rights for men and women, which creates lots of issues for the employer. I’m seeing lots of lots of legislation being passed and enforced by the city’s Office of Labor Policy and Standards without a lot of opposition, so I would encourage you to think about what you can do. I know that the state department of labor had several hearings on this law. I know that the New York state is considering its own scheduling law that would possibly preempt this law. I think there are some other federal preemption arguments that can be made with respect to this law similar to some challenges that you can expect to see over the Freelance Isn’t Free Act, but as a industry, as a community, you have to get together, even though you’re competitors in the ordinary world and have your voice heard and start fighting back on these types of things or you’re going to continue to have these kind of laws that apply to you that you have to figure out how in the world you’re going to comply with. We’ve got this one as of right now. We’ve got to deal with it, so I will get off my soap box and we will get into the details, but I wanted to make sure that you did understand that you’ve got some power and some voice in this. So let’s first start with who’s impacted, and the laws primary relate to fast food establishments and retail establishments, and how they’re defined, as I was getting at earlier, is pretty surprising to me in comparison to some of the other state laws and city laws that we see like this. Remember, this only applies to New York City employers. It’s a New York City ordinance. There are five of them. It only applies to certain fast food establishments. As you can see on this slide, fast food is exactly what you would think it would be, fast food. The part that is surprising to me is how they define who would be covered, the size of the company, and in one instance, they’re talking about an integrated enterprise that has more than 30 locations. I would consider that a large employer if you’ve got more than 30 locations. That’s similar to some of the other laws we see where the requirement of 40 locations, or more than 500 employees. By integrated enterprise, what they’re talking about is one central company, one single employer. Even if it’s incorporated separately, if it’s effectively one company that would be an integrated enterprise. The surprising one here is the next one. A member, a franchisee in a franchise system that has more than 30 locations nationally. That’s going to be most franchise systems where they have 30 locations, and the point is is that a franchisee with, say, one McDonald’s is now obligated to follow and comply with all these laws as a result of the franchisor being big, and that doesn’t make any sense. What does that have to do with the franchisee and the franchisee’s resources to comply with all this? Very, very challenging. Very surprising. On the retail side, it’s similar. Now we’re talking about is a retail establishment that has 20 or more employees, and the definition of retail, as you can see, is very broad. 20 employees. That’s a very small employer. Compare that to 500 in Oregon, or 40 separate establishments in San Francisco. Much, much different animal that applies to a smaller employer. Let’s get into this, the nitty gritty and what has to be done, and this is where we’ll kind of feature some of the solutions. I hate to be the bearer of bad news. I hate to communicate this kind of stuff because it’s frustrating. It’s frustrating to have to do it, but trust me when I tell you it’s better to hear it from me and to start working now on compliance than to wait and deal with some of the penalties and the back wages that you will be stuck with later. I had mentioned earlier that those firms that we saw a few slides ago have plans to bring these kind of suits, and these kind of suits … when I say these kind of suits, what I’m talking about are class action lawsuits that would be filed against an employer that just isn’t complying with these rules. Either they didn’t know about the rules, the didn’t comply with the rules, so it’s a bit of a double whammy. You have this state-funded coalition, this group that can investigate, either independently or as a result of a complaint, almost like the Department of Labor, and then you have plaintiffs’ lawyers, which is an even worse scenario that will bring a suit, will confirm that you’re not providing the adequate notices, paying the right premiums, the things that you’ve got to be planning for now, and they’ll just bring a class action lawsuit, and if you don’t have these policies and procedures in place, that will be a pretty easy lawsuit to bring. The way class actions work in New York, if you don’t know, is all you really need is one individual to bring that lawsuit, and that individual will be able to represent everybody else, and what you need is you need a hook. You need something that makes that individual similarly situated to everybody else. The type of hook that you use for that is, “Well, you have my schedule was changed, and I wasn’t paying a premium.” The company’s either paying these premiums or not paying the premiums, changing schedules within 14 days or not doing that, so that’s a pretty easy class definition, and once my class is established, the class is defined as every single person that was subject to that same rule, and it’s an opt-out type of process, meaning that you’re going to have 100% of your employees that are subject to the rule included in the class unless they affirmatively opt out, and these employees are not going to affirmatively opt out of the case, just like you don’t opt out when you get a notice in the mail about your credit card being a class member, and your credit card, or whatever it is, they’re not opting out of that unless they’re planning to sue you independently, so when you see opt out, that’s actually not a good thing. In all ways, we want to avoid those class actions. Once way of doing that is with arbitration agreements, which we’ll talk about in a minute, but irrespective of your arbitration program and trying to avoid class actions, you’ve got to be compliant with these rules because if you can demonstrate compliance, you are no longer that low-hanging fruit. You can demonstrate, just like a wage theft notices and what’s on your pay stub, that you are in compliance. So what we’re going to do is talk about what the requirements are, and then show some of the solutions that at least Deputy has created to allow you to easily do it. There’s no point in us telling you what you need to be doing without giving you a solution as to how to fix it. With the written schedule requirements starting with the fast food employers, effectively what you’ve got to do is provide notice, and it’s considered a good-faith estimate of the expected schedule, the number of hours. It’s got to be in writing. The days that they’re expected to work per week, at the time that you’re hiring an employee and before or at the time that they receive their first work schedule. You’ve got to provide this notice. This should be a separate document. It should not be included in an offer letter because this notice, you have an obligation to update it if the schedule changes for any significant amount of time. You’ve got to provide a different good-faith estimate. That would be a strict liability violation if you’re not providing this notice. Not so hard to do, but you just have to make sure that you’re doing it. On the retail side, that notice and that schedule’s got to be provided within 72 hours before the first shift that’s worked, so centralize your notifications. The other piece of this that I think is important is that if you are communicating already, which a lot of you are, to your employees via text message, if that’s how you handle your scheduling, you have an obligation to provide these notices in that same manner, whichever manner it is you’re using: email, text, whatever it is. So one suggestion that we have is to centralize your notification process. Have one way of doing it, and only use that way, and don’t rely on text messages and emails and those sorts of things that are going to create additional obligations for you. You are already going to have to post notices, as we’ll discuss here in a minute, in conspicuous places at the workplace like a break room or in front of a time clock. You’re going to have to provide these individual written notifications to employees, so don’t increase your burden by having alternate means of communicating with employees. Pick one way. Then the other takeaway is to automate the process as much as you can. This is an area where I think Deputy can help. They’ve got a solution for how to provide these notices. I’m going to turn it over to Derek to explain. Derek Jones: Great. Thank you, Angelo. What Angelo and I will be doing as we cover the individual requirement, we’ll be showing how Deputy can solve for each one of the major theme. But I think before we even get into the technology, I think the one thing I want to emphasize is as we have been digging into this law in New York and Oregon and San Francisco, we are shocked at the number of, not only independent, but actually mid- to large-size brands that are not aware and are not planning, or were not previously planning on making any adjustments to how they’re going to react to the law. I think while we will cover the way to handle and respond to these curve balls using technology, we would advocate that you at least prepare your independent company to do something different. As Angelo mentioned, the plaintiffs’ attorneys will be coming very quickly, especially as we start to take a look at the premium. What Angelo just mentioned is there are two requirements. One is providing a good-faith estimate up front of the hours that the employer expects that employee to work. 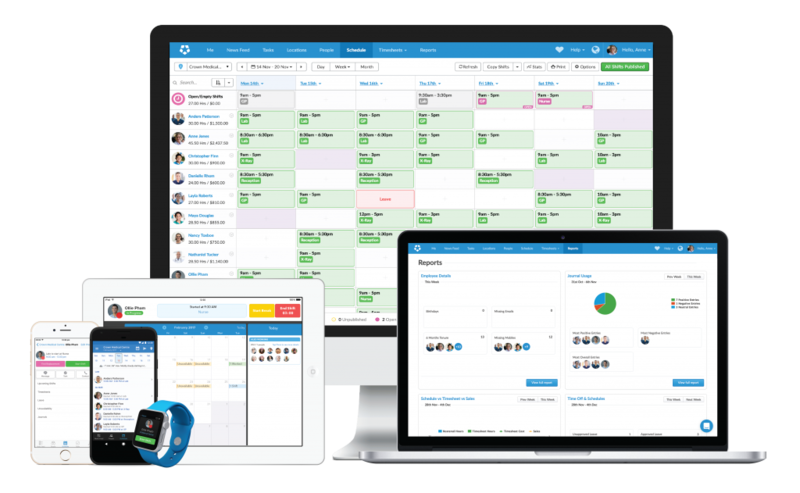 Inside of Deputy, which is a workforce management platform, effectively today we would replace your pen, paper or Excel scheduling. Send those schedules out to your employees, and then allow them to you as the employer to send those … that clock in and clock out data to a payroll provider. But within that system today we have what’s called a communication portal. Simply put, this is an email alternative. What we track today for all of our new customers who come on board, actually 71% of employers do not even provide an email address to their employees, so as Angelo mentioned, we need a way to centralize the communication, so you have a manifest of providing this good-faith estimate. I think what we want to do is provide a defense for you if the employees or the plaintiffs’ attorneys say, “Well, you did not provide that good-faith estimate.” And if you can send that out electronically, and that electronic communication is stored and archived, then you’ll at least have that to defend yourself. What you can see on the screen here is a very simple way that Deputy allows employers and scheduling managers and the hiring managers to send the communication to an individual employee. You can see the example I have here that says, “Hi, Kyle. Attached is your good-faith estimate of your anticipated work schedule.” What we’re also able to do is similar to the way that an email has a read receipt, a scheduling manager or the hiring manager can attach the PDF, so whatever document you have that might provide that good-faith estimate, and then you can require that that user confirm that they have received that particular notice. That is then of course saved in Deputy for six years. I believe the law is requiring three years of archiving of some of the communication. Again, the point here is provide it in writing. If you’re even today don’t have a scheduling system, make sure that you have some form of documentation. I think Littler can help and assist with templates for this, but that you’re including that good-faith estimate when you’re hiring the employee. The second part of that notice is providing the anticipated schedule in a conspicuous place to the employee, so what you see on the screen here is one version on a desktop device, which an employee can also see the schedule on a mobile or a tablet, of the three things that are really required by the law: the date, the time, and the location. You can see we have kind of a fictitious business here that’s a ball park and it says I’m supposed to work as pitcher, and if you take a look, you can actually see that it says Great American Ballpark. The employees can click that and see the location that they’re scheduled to work. In the bottom right hand corner there is the estimation of the hours during that work week. Those would tick and kind of satisfy the requirements, not only to provide the initial good-faith estimate, but to provide the notice of the upcoming schedule two weeks in advance. Angelo Spinola: On that schedule, just to recap, before the first day of work … we’re talking about the new hire, you’ve got to provide them with a written work schedule that identifies all their regular and on-call shift. Then, and that schedule’s got to be at least seven days … seven-day perspective period. After that, for this is for the fast food employer, remember … after that you’ve got to provide a schedule that does not change with at least 14 days’ notice, so after 14 days, if the schedule changes in any way, unless it’s the employee’s own doing, which we’ll get to in a minute, like shift swaps … we’ll talk about that in a minute, you’re going to pay a penalty, a fee, for changing the schedule. To the point I was making before as to what perspective and what voice the legislature was listening to, the council, it was all employee side, and that’s why it’s called a premium. It’s called a premium, not a fee. From your perspective and my perspective, it’s a penalty, and the whole concept of the law, which makes sense to a degree, is that these kind of workers should be able to set up their child care, have other jobs, go to school without their schedule being jinked with all the time and changed and flipped upside down. What I think that the law does not recognize is the incredible difficulty that exists with trying to predict a schedule two weeks out and then not have anything change to your schedule. Have nobody calling out. No issues that were unexpected, so one of the things that is very, very important, since you’ve got this 14-day requirement … it’s a little easier for the retailers with the 72-hour requirement, but at 14 days, you have to spend a lot of time to make sure that your schedule is accurate and precise. You’ve got to predict some things. You’ve got to know what your metrics look like. When you’re going to need more people or less people. What are your high and low spots because you can’t just send somebody home a little early like you used to be able to do. You can’t say, “Look, it’s Friday. We staffed up but there’s nobody here. It’s dead. You can go home four hours early.” If you do that, there’s a very significant penalty fee that you’re going to have to pay that individual that’s not going to be worth your while to do, so you’re going to be overstaffed or understaffed. Even if you’re calling somebody in to give them extra hours, you’re going to have to pay for that, so it’s going to be really, really important that your managers are aware of what the scheduling requirements are, that they understand what these obligations are, but that you’re able to accurately predict what your needs are well in advance. And then just to cover a couple of these other things, it’s got to be posted in a conspicuous area, so, again, time cards right where they’re punching in and out. That’s a good spot to have it. In the break room, something like that, but managers have to be aware that they’ve got to post the schedules, and if there’s changes to the schedules, they’ve got to post those changes within 24 hours. We’ve got to provide hard copies of these schedules to the employee, and then we talked about the idea that if you’re using text, which we’re not going to use anymore, right? And email, which we’re not going to do anymore. That’s just going to add a third obligation that now we’ve got to also send the schedule in that manner and update the schedule in that manner as well. With respect to switched shifts, changes, when a change does come up, you cannot require an employee to pick up a shift that’s outside of their regular work schedule. They can refuse you, and they can refuse you without any recourse. If they agree to pick up hours, you have to get their consent. That consent must be in writing, and if a significant change, meaning, let’s say, that we say, “We’ve got Saturday mornings open now and somebody pick that up on an ongoing basis,” not that good-faith estimate that we provided them at the start of employment, that’s got to be updated, and we’ve got to give them a new good-faith estimate, and that also should be in writing and confirmed that they received it, so you’ve got to think about not just communicating it. The law’s pretty specific that these things have to be in writing and provide, so you’ve got to be able to demonstrate when you gave it to them, what you gave them, and that it’s accurate, and then you’ve got to post any changes to the updated schedule within 24 hours of the change. Some pretty onerous requirements, especially when you’re considering that 14-day rule. With a retail employer, it’s a little bit different. 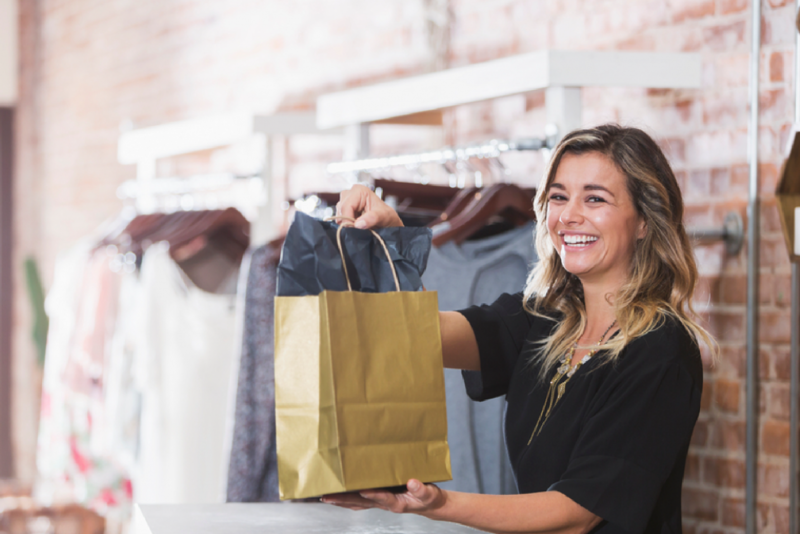 What the law related to retail employers requires is the retail employer is no longer allowed to schedule employees for on-call shifts. What on-call shifts means, according to the law here, is if the employee is told, “You call in and we’ll let you know.” In other words, what the employer is doing is waiting and seeing and reacting to the workflow and reacting to the need to schedule. Instead of pre-planning it, we’re going to see how busy we are and who’s available, and you call in and we’ll let you know if we need you or not. From the employees’ perspective, they don’t know if they’re working or not until right up at the start of their potential shift. That’s completely prohibited now for retail employers. Same thing with cancellation. You’re canceling any regular shift within 72 hours, you’ve violated this law. If you’re requiring the employee to work less than 72 hours’ notice, so you’re calling them up after 48 hours and telling them they need to work, that’s prohibited as well, so the notice period is a lot shorter, and the 72 hours a little more manageable, but still nonetheless something that you’ve got to comply with and make sure that we’re doing it the right way. If a retail employee requests time off, you can give them time off. You can allow them to trade shifts. That’s also true for the fast food employees, and we’ll talk about that. I think that’s an extremely important point, and then if there are some very, very limited exceptions that require you to change shifts, then these can be excuses without you running afoul of the law or, in the fast food setting, paying these penalties, and that would be if there’s some threat to your property, if there’s a shut down of public transportation, fire, flood, declared state of emergency, or a zombie apocalypse. I made up that last one. So, takeaways here is make sure once you’ve set your schedule you need to stick with your schedule. You don’t want to be sending people home early, adding people at the last minute. Your people that you have responsible, your managers that are responsible for these shifts have to understand that. They have to know and plan for this. It’s a whole new ballgame to how some employers are doing things now. Then when it comes to call outs, I think this is one of the most significant things because understand this. The way that this works, if a fast food employee calls out, says, “I can’t make it.” I don’t owe that person since they’re the ones calling out. I don’t owe them anything, but whoever I’m replacing them with, I owe a premium to, even though that’s absolutely not my fault. That’s an employee-driven issue that causes me to now have to restaff because it’s premium, and somebody who doesn’t get their 14-days’ notice or 72-hours’ notice is now entitled to additional pay, so the way to handle that is to empower your employees to cover their own shifts, and I love the way that Deputy does this. I think this is a really, really nice way of documenting and requiring employees … “Look, if you’re calling out, you set your own shifts.” Gather your own shifts and find your own replacement without our involvement so that you’re not paying penalties. Now, the employees are electing when they’re going to work on their own, and you don’t have to cover these premiums, so I think that’s a pretty significant and important way of sort of transforming how you’re covering call outs today, and there should also be policies and procedures around this that will help to define for the employee what their obligations are and expectations are. I’m going to turn this over to Derek to show how Deputy is dealing with these call outs, but one thing I wanted to point and, and I think it’s great, is there are other penalties that apply, for example, with respect to clopenings and obligations related to overtime, so you don’t necessarily want employees to have free reign to just switch with anyone because it might create another problem for you. Now you owe … they switch with somebody that has already worked 60 hours. You owe them overtime, or they’re not getting their appropriate day of rest, or they had just closed the night before, so now we have to pay a premium based on the fact that they’re opening and closing on alternate shifts, so what Deputy can do, and I don’t want to steal Derek’s thunder here, but it can provide the employees who are available to accept the shift, and then allow the employee who’s calling out to contact those individuals to see if they want to take it or not. Derek Jones: Thank you, Angelo. I think I can start this off by cough cough. That’s the message that the employee calls you up on a Friday morning before the coffee shop opens, 5 a.m. They have a cough. They’re sick. Normally that message today is taking place via a phone call or maybe a text. The issue with this, as Angelo mentioned, is if you don’t have documentation that the shift change is occurring at the will and the direction of that employee, that they are actually calling to cancel or modify their shift, whether it’s showing up late, to shorten the shift, or to cancel that shift altogether. If that is a phone conversations today or a text conversation today, it doesn’t provide the line of sight that you need. Here’s how Deputy recommends to do this. That employee is still going to call you, or they’re still going to text message you, but within Deputy’s platform, the manager or the scheduling manager who’s receiving that phone call will ask the employee to convert that phone conversation. Log into Deputy on their mobile device. That is what you see on the right hand side of the screen, which is our news feed. The news feed is kind of wrapped around the scheduling and the time and attendance solution, so what would happen is the employee logs into their mobile device and actually types out, in this scenario says, “Hi, boss. Per our phone call, I’m sick and need to day off,” and that way that’s documented and stored. Then the boss could replay back and say, “Hey, I got it. Now please attempt a trade or offer your shift to others that are available.” That way the manager isn’t stuck with … the next step for the manager is to call a list of employees. This would satisfy the written requirements of that employee who’s calling off to say this was done not at my boss’s direction, but at mine because I actually called that I was sick. Imagine six months from now or a year from now how many call outs that you have that are handled over the phone. If one of those really aggressive plaintiff attorney firms are calling around, and they might ask, “Tell me how you called out today.” And they say, “Well, I normally call.” That becomes a hearsay situation that’s very hard to prove as the employer is … I guess the only way to prove it would be if those phone calls are recorded, which I don’t even think is required. I think New York’s a two-call consent state. This is how we suggest initiating. Convert the offline phone calls of calling out sick or late into the newsfeed communication as the first step. The next step is this is a picture of one of the time cards that an employee would fill out, and this could be on a desktop. We have a tablet option that you can post at a workplace, or even on their mobile device. What Deputy has is what’s called a custom asset station builder, and that’s just a fancy way for saying we can ask questions that you want to ask the employee and require them to answer those questions when they’re clocking out of their shift. For this example, this could be a fast food or let’s say a delivery driver for a pizza company. They can enter their tips, they can enter their mileage, they can confirm that they did not work off the clock, all the things that will keep you compliant, but now in New York you can add the fair scheduling language. And we have kind of an example language here that you could add, which says, “I attest that all hours worked were agreed upon by myself and were worked at my request,” and this is a layer of protection that you could provide given that what Angelo just mentioned is that there needs to be some level of written consent if they’re accepting those schedules within the 72-hour period or the two-week period. All that information is stored. It’s available. It’s stored for at least six years within Deputy. Most importantly here, as we get into the law on November 26, this is going to take time to train the employees. Scheduling managers, especially as they’re going to need to begin optimizing the initial schedule, anyways. They’re going to need to create a smart schedule instead of just sending people home or over or under scheduling. What happens in this workflow is if the employee is filling out their time card and they select no, the manager will be notified immediately. Whoever scheduled that employee will be notified, and they’ll also be sent an email that says, “Hey, this employee filled out this time card and they actually said that they did work hours, but they were not all agreed upon.” What we also do within Deputy is we will flag the time card, so just in case that manager was busy, kind of ignored the communication. If that scheduling manager or whoever the payroll manager is, we’ll flag the time card with a notice. That way, they can followup with that employee to find out what happened and why are they claiming that they worked hours that were not agreed upon. The last thing here, and Angelo had mentioned this as well, is … here’s the final step of the workflow. The manager receives that phone call that says the employee is sick. The employee goes into Deputy, fills out in the communication portal that they are sick, and the managers says go trade that shift with somebody else. As Angelo mentioned, there are a number of things that that can cause a problem if the employee is just calling a random list of their coworkers. What Deputy is able to do, is not only will it allow you to trade shifts with employees at that location, but also if you are a franchise location, we can set up permissions in a hierarchy that will allow that employee and the scheduling managers to actually see employees across their organization, so across other locations within a certain mile radius, however we want to set that up. The takeaway point here though is, you don’t just want a list of 50 people who are available that day. You want a list of maybe four or five people who are available, who are trained. You don’t want to offer a pizza delivery job for someone who makes the pizza, or you don’t want to offer a shift for someone who’s already worked 39 hours, and the shift that’s coming up is eight. All of a sudden, now you’re in an overtime situation that you were not expecting. So what happens on the right side here, you can see the employee logged into Deputy, they went to their shift and they just clicked a simple button that is going to allow them to swap that shift or offer the shift up. What happens is the list of employees are listed, but only those employees who will not exceed overtime, are trained, are preferred, who aren’t on PTO, aren’t on vacation, and haven’t listed that day or time as a time that they’re not available for work. That employee can then select the members of the team they want to invite. They click the blue button. Invite those coworkers, and it works on a first-come, first-served basis. First employee to accept it will receive it. Now, in the Deputy platform, that employee owns the shift until somebody else picks it up, so it’s not like you’re just not going to have someone show up. I think we covered kind of the workflow there from cough, cough the phone call, to converting that into an offline conversation, to swapping the swift, and then getting that shift to the new employee. All that’s handled out of the box, and certainly is a way that will prevent you from doing it on pen and paper. Angelo Spinola: Now, what if you need to hire somebody new? Let’s say that you decide that we’ve got to hire some new folks. We have another location, perhaps. Perhaps business has increased. For the fast food employer that is covered, you cannot hire anybody new until you have provided whatever the shift is that you’re trying to cover, you’ve provided an opportunity for your existing employees to pick up those shifts. It doesn’t matter if it’s a terrible employee, somebody that you really don’t want working extra shifts, or your best employee. You’re going to have to offer to existing employees these shifts before you can hire anybody, and you’re going to have to keep that offer open for three days. What does this mean? I think one thing is performance management has a whole new meaning for you. Before you go hiring new people, you might want to get rid of some of the folks that aren’t getting the job done. It creates a little bit of a chicken and egg problem for you because you need to get your schedules covered and eliminate people. Normally you hire the people that you’re going to replace the people you’re terminating with before you terminate them so that you’re covered. So that they’re trained. It’s going to have to be a little bit different than that in this new world where you’re either using other existing employees for purposes of covering the shifts of those that need to go, but what you don’t want to do is continue to give additional hours to somebody that’s a poor performer, which this requirement would obligate the fast food employers to do. What you would need to do prior to hiring anybody new is you would have to offer the opportunity through one of these notices that’s posted that explains the number of shifts available, the schedule, whether the shifts will start at the same time. Allows the same kind of information that you have to provide in that reasonable estimate. How many people are needed to cover the shift? One thing you do not have to do, thankfully, is offer these shifts to people who would otherwise be in an overtime situation, so existing employee that’s already a full-time employee and providing that shift, as Derek mentioned, would put them in overtime, that we don’t have to do, so having a software that can cycle those people out and identify only those that need to be provided the notice is great. The other thing that you’ve got to do is provide the notice first to the employees in the location, so, for example, let’s say somebody quits and takes another job at a location on Broadway. You’ve got to provide the employees at Broadway that opportunity first, those employees that could increase hours by taking these shifts without getting into an overtime situation, and then if the people at Broadway don’t want it, then you offer it to other locations of yours. If you have other locations with other employees, they get the second crack at it, and if none of them want it, that’s when you can hire somebody. Here’s the real kicker to me, is if you do that and you offer somebody some additional work and they take you up on it, and it’s within that 14 days, you have to pay that penalty. You’re paying, even though you’re advantaging them, you’re giving them an opportunity that we didn’t otherwise have to do before this law. Now we also have to pay them a penalty as if we did something to them that we shouldn’t have done, and that’s one of the biggest problems I have with this law is it would be one thing to pay a premium or a penalty to folks who are being adversely affected by scheduling changes. I do not understand why a penalty would be required for somebody that’s getting the benefit, who’s voluntarily choosing to work extra time. That really bugs me. What’s the other takeaway here is make sure that you are planning well in advance if you need to change schedules. That’s not just 14 days because it’s three-day notice, and the fact that it might be tiered notice where we’re giving it first to people at one location and then other locations, so now you’re talking about six days, so you want to be at least three weeks out before you plan on making any schedule changes, any hiring of new employees so you can meet these obligations without having to pay these premiums. Derek, do you want to talk a little bit about how Deputy can manage the talent pool? Derek Jones: Yeah. You’ve absolutely got it. I think one of the … as Angelo and I were prepping yesterday for the webinar … I think one of the … we try to find silver linings when these things happen. If there’s one, it could potentially be this one, at least from the perspective of the employer. What we found in a lot of discussions with even local brands that have two, three, four shops, but especially franchise and large national brands, is they already have this … I will say kind of not necessarily an issue, but a restriction that if you’re one pizza location of a franchise, that franchise location, even though the franchisee owns multiple locations, typically is only offering shifts to the pizza makers and to the drivers that are primarily employed at that location. What I think the statute’s requiring is to start thinking about regional talent pools, so if you have multiple locations, within this particular jurisdiction in New York City, the technology enables you to assign a primary location to an employee, but to assign two, three, four, or five locations as backups for each one of the employees. When you think about, particularly as it relates to retail, where there’s a 65% turnover rate, and when you look at the stats that the National Restaurant Association and other trade groups provide, one of the top reasons why that turnover rate is so high is because the employer can’t provide consistently the hours that the employee wants over a duration of [inaudible 00:53:42] time. What you see here on the screen is that an employee could work at one location … Deputy, that’s my location. I just gave an example here, like maybe I also say I’m willing to drive to Papa John’s in Alpharetta or Centerville or Campton, all within maybe a 20-mile radius of my primary location. What this enables the scheduling managers to do is stop thinking about isolated labor pools under one roof. If you have multiple locations, you need to start thinking about regional talent pools, and the unintended positive consequence of this is that when you run into those situations when you need to fill a shift and you’ve offered the shift to the employees at that location first, that you will actually hopefully have additional hours to offer to those employees who feel like they’re underutilized, or you’re not giving you the hours that they’re looking for. The technology here exists to make this happen. We’re able to set a primary location and a backup, and we can set up certain pay details by location, so if at one location it’s a certain pay rate, or even there are other employment terms like the number of hours that that employee can work, or they’re only trained in a certain area at one location, we’re able to set that up and make sure that the system only recommends and only will ever directly, or through the trading of shifts, the shift to the employees who are available, trained, won’t hit overtime. Angelo Spinola: Great. All right. Let’s get to this premium pay/penalty and explain to you how this works. And the takeaway that I want you to get from this is your managers are not going to get this right. They are not going to get this right. They are not going to get this right. You did not hear me. They are not going to get this right, and I can tell you from experience in having to deal with these kind of premiums and penalty payments in California related to meal periods … when meal periods are missed, there’s a certain premium that you have to pay in addition to the meal period, or interrupted, and there is just a tremendous amount of litigation over the failure to pay those premiums and not understanding those rules. That’s one premium. That’s one amount. Look at this screen and what they’ve got to learn to do. I couldn’t recite this to you. I’ve got to read it off the screen just like you are. It’s a pain. You definitely want to make sure that they’re trained and educated on what it is they’re supposed to do and what they have to pay if they don’t, but more importantly, automate this process. If we miss it, if we’re in one of these red zones, just add the premium. Add it directly to the pay. Don’t really on somebody to manually adjust somebody’s pay, because I’m just telling you right now, it will not happen. So here’s the deal. For every situation where we have a work schedule provided to somebody that’s in between seven and 14 days … this is a fast food environment again. We don’t meet the 14-day threshold, but it’s beyond seven days. We’re in that sweet spot, and we are adding hours. The schedule actually benefits the employee, then there’s a $10 premium that’s added to their pay. If instead of adding hours we’re subtracting hours, it’s a $20 premium we’ve got to pay. If that scheduling change happens less than seven days, so now there’s less notice, then we’re talking about $15 when hours are added. If hours are subtracted in, say, the same less than seven-day period, it gets jumped up to a $45 penalty per occasion. And if it happens less than 24 hours, and this would be the scenario I gave of “Hey, we’re not so busy tonight. Why don’t you leave a couple of hours early or come in a little later this morning?” You’re talking about $75, and that’s any change in the schedule. And that begs the question that I want to cover here in a second, but that’s a very, very large premium, $75, that obviously is designed to cause you not to do that, not to change anybody’s schedule on that day, and it’s very rarely going to be in your best interests to do so. Now we [inaudible 00:58:27] remember about nonexempt hourly employees, employees that are tied to overtime, so this would not be true of a manager. That’s one thing that you can still do. It doesn’t really matter that much for you. The reason that you’re sending hourly employees home early when the work doesn’t dictate that they be there is because you can save money that way. For a salaried manager, sending a salaried manager home might make that manager happy, but it’s not saving you anything because you’re still paying them their salary, no matter if they’re working four hours or eight or 10 or 12. What happens then … and I’ve asked myself this question. I’ve looked at the law, and this is, again, another example where nobody cared about this because nobody was looking at your side of things, what if somebody clocks out five minutes later? They’re cleaning up and are five, 10, 15 minutes late to their scheduled time? It’s not your fault. It’s not anything that you requested. According to this law, that premium would be owed. The premium does not include any kind of grace period. Some of the other laws have a 30-minute grace period, an hour grace period, two-hour grace period. As long as you’re pretty close, there’s no premium. I think that’s ridiculous. I can’t imagine, at least at the city level, if somebody clocks out at 5:01 when they’re supposed to clock out at 5:00, which happens all the time, that they’re going to enforce these penalties, but the law, the technical reading of the law, says that. So you have a decision to make, and this is one of the areas when I talk about policies and adding policies, of having … there’s some ambiguity in these laws because they’re so one sided, that I think need to be cleared up through policy, so I would, instead of paying somebody a $75 premium for leaving five minutes late, I would have a policy that would cover that that I would then show the city investigator. If the city investigator said we think you owe these premiums because these people aren’t clocking out exactly at the time they’re supposed to, or they’re coming in a little late, well we have a grace period, and that’s something that the employee agreed to and signed off on. I would start adding some of the detail that really needs to be in this law in my policies to give me a better chance of establishing that the policies are agreed upon by all parties, they are reasonable, and they should be given weight since your law isn’t realistic or is silent on that particular issue. Other points regarding these premium pays is you’ve got to pay them at the same time as the regular payday. The same apocalyptic interruptions … these interruptions are very, very limited exceptions would apply here for fast food employers as well, and, like we said before, if somebody is added because somebody else has called out and it’s within that 14-day period, which is going to happen and it’s of no fault of your own, that premium would be due, and the law is relatively specific on that, so we want to make sure that we can use the technique that Derek mentioned regarding employee swaps as much as possible. Here’s another little brain twister for you. What happens if somebody, I have to fire them? I fire them. Let’s say they were stealing, and I fire them. I say this is your last day of work. I’ve changed your schedule, right? And I’ve changed it within 14 days, right? Actually, within 24 hours, if I’m firing them right then, so guess what I owe? I owe them a premium for stealing from me. You think anybody thought about that when they were looking at these laws? I don’t think they did. Would I, if I was you, put in a policy so that if you’re fired for cause you’re not getting any damn premium? I probably would do that. Is there a risk there? Yeah, there is, but my point is that we need to speak about some of these things, and in an ordinary situation if you’re going to terminate somebody, give them two weeks, if you can do it. If we decided we’re going to move on, you give two weeks and you can avoid some of these premiums or at least you can lessen the premiums. Now, there’s going to be situations where you can’t do that because you really want the person out, and that’s understood, but when you can plan for things, that’s generally going to be better. Derek Jones: Excellent, so as Angelo mentioned, managers will probably get this wrong. Managers will probably get this wrong. They will probably get this wrong. Paying the premiums and having visibility of when that schedule changed based on those tiers that Angelo went through, whether it’s 72 hours or 48 hours or two weeks, what Deputy is able to do … what you see here on the screen is a time card, and this is a timecard that a manager has logged in on their desktop. They can also review the timecards on mobile devices as well, but what you see is you have an employee who worked from 9 to 2, but what we’ve indicated here is that the Deputy platform will recognize when that schedule changed based on those laws, and so let’s say for example this shift was changed within 72 hours, or let’s say between seven and 14 days, as the example implies. Not only are we paying this employee for what what we show is a 4 3/4 hours here of ordinary time, what Deputy is able to do is add a unit of pay through a feature that we call shift loading, and what we have loaded here is the premiums for the New York fair work week, so the kind of acronym down there is New York FWW for Fair Work Week schedule change premium 7-14 days. Now, Deputy’s time cards operate like a traffic light system. If the time card was filled out perfectly, and there were no exceptions and there were no schedule changes, you as a scheduling manager or the payroll approver has the ability just to automatically have those timecards be approved. But what you see here is the reason this timecard is pending is not because the employee worked more or less of their ordinary time or they didn’t clock into their break, the system is actually indicating that there was a schedule change. We’re going to flag the timecard, make sure that the scheduling manager knows this, but we’re not going to automatically add the time onto the time card. We’re letting the scheduling manager know, “Hey, look. We saw a change,” and you as a scheduling manager can either investigate that and call the employee, call the scheduling manager, call to find out what happened operationally that day, or you can just approve the unit of pay. Then of course we will tie that into your payroll export format. You would just need to add … I think there’s six premium types, or there’s five or six. Those are just five or six additional columns within your payroll provider, and so we’ll build those in, and then we tie those in to you payroll provider, whether it’s ADP or Gusto or whoever it is, and if there’s a unit of pay in that column, then it means we need to either pay that person $15, $50 up to $75 of pay. The key thing here is the automatic detection of the change, flagging of the timecard, and the ability to easily add that unit of pay. I always struggle with saying that because I know that as an employer, if you’re looking at the bottom line, easily adding $75 of pay is not necessarily something that you’re really excited about, but, as Angelo mentioned, the alternative … and when we get later in the presentation, the fact that employees can bring individual suits against the employer, paying that premium when there is an actual schedule change is going to be a much better alternative than handling penalties and a plaintiff suit. Angelo Spinola: One other point on the premiums. If we’re paying the premiums, it’s super, super important that it’s a separate line item, like Derek mentioned. That you can identify the premium separately from wages. They are not considered wages. We don’t believe that they should be factored into overtime as wages either. I think that it’s going to be similar to what we see with spread of hours in New York and some of these other kind of additional penalties and the law does say that it’s not treated as wages, which is I think what they mean, but we’re going to get some clarity on that and just confirm that point. It should specifically say in the law that it does not count towards an increase in the overtime rate, but the point is is that if you don’t have a separate line item, then you’re probably in violation of the wage theft disclosure requirement in New York where you’re identifying specifically what people are being paid, what rates they’re being paid, and for what. What category of pay they are getting. I have seen time and time again where I’m working with a client, and the client will say, “My software, my timekeeping doesn’t allow me to do that, or my payroll system is limited in that regard.” And that is going to be true for most of the systems that are currently operating in states like New York, cities like New York at the moment. States like Oregon that have these rules, and these companies are going to have to adapt, and it’s very, very important that if you’ve got some limitations, that you work with these companies to make sure that they fix the limitations or you work with somebody like Derek that doesn’t have those limitations. Nobody’s going to care that your software can’t do it. They’re only going to care that you didn’t do it, and if you didn’t do it, you owe, and there is no excuse that it wasn’t possible. Find some workarounds in the meantime, where you might have to self report some stuff and send some stuff directly to the employee if it’s not on their pay stub showing these premiums, but you’ve got to make sure that you’re doing that. One other area that we wanted to briefly touch on are these clopenings, the idea of closing and then opening the next day, and the prohibition. It’s 11 hours that’s standard in New York. Basically, if there is less than 11 hours between the end of the first shift and the beginning of the next shift, you can’t require an employee to work that next shift unless the employee consents in writing. If there is a situation where somebody is opening less than 11 hours from a close, or really any shift start and stop, then there’s $100 premium associated with that, which I think is the sixth premium that Derek was referring to. So very important that your scheduling software, how you’re scheduling, you’re able to identify those kind of situations and flag for the manager who is responsible for scheduling that there’s an issue that may cause a premium to be paid. Derek Jones: Excellent, so this is normally the [foreign 01:10:26] of the scheduling software piece here because it will bring all these factors together with what we call Deputy auto scheduling. Today most schedulers are … we kind of categorize this as whack-a-mole. You have an opening. You’re just trying to put a body in that shift. Obviously, we can’t just do that anymore, but you’re probably already considering things like who’s my reliable employees, who are my preferred employees, who’s not going to hit overtime? Those are things that, even if you’re using pen, paper, and Excel today, that you’re kind of manually thinking about. What Deputy has done to combat not only the standard scheduling considerations like overtime and training, etc., is we’ve built in an auto scheduler, so if you have, let’s say, Monday through Friday, you know that you need someone at a pizza shop between 12 o’clock and 7 o’clock as your second shift. Well, you’re normally going to start putting names in those boxes, then you have to reference a separate spreadsheet to know are they off? You have to log into the HR system, then you have to think are they going to work overtime? What Deputy does here, you can see this is an example of a five-day work week where the manager has 121 open empty shifts, so these are just shifts that don’t have people assigned. Instead of pen and paper and Excel or even dragging and dropping in a standard scheduling electronic system, what Deputy does is actually uses machine learning and a very simple easy-to-use artificial intelligence back end. What you need to know is it’s easy as pressing a button, and what it does, you can see there are many factors. Is this employee going to hit overtime? Are they trained for that particular area? Are they preferred? So within Deputy you’re able to say, “Hey, look. I normally have pizza tossers, and these are my four preferred pizza tossers.” You’re going to have other people who can toss the pizza, but these are my four preferred. If they’re available, trained, and not going to hit overtime, all [inaudible 01:12:33] schedule these four. We also look at cost, so not all employees are paid the same, so one employee might earn $15 an hour, and one might earn $17. Deputy also is taking a look at availability, who has requested time off? So if you see this, you can see on the right side these are just simple toggles that you select. Is cost important? Do you want to try to provide equal hours? And the system will actually learn from your past schedules of which employees actually ended up punching the time card and got approved to payroll, because it doesn’t really matter who you schedule. If you have an employee who calls out four out of five shifts, the system actually knows that and instead of … Angelo mentioned as a recommendation to start cleaning your house a little bit. Start trying to identify those employees that are already giving you a headache. Well, the Deputy auto scheduler can learn that and understand that even if two employees are available, Employee A has a 10% call out rate, and maybe Employee B has a 30% call out rate, so if you end up changing those schedules, and employee A ends up usually working, that’s kind of hard to remember, though, even across five or 10 employees. So by bringing that all together, we’re able to consider all those factors, including what you see down here at the bottom. That’s called an advance recipe, so what we’ve done is we have this ability to build custom rules when these laws come up, so what we’re able to do is we’ve created what’s called a recipe that’s going to prevent an employee from being assigned into a consecutive shift where there’s less than 11 hours of rest, so even if all the other factors are met, meaning they’re trained, they won’t hit overtime, they’re available, they’re not on PTO, etc. that this is not going to allow that employee to be scheduled in with the auto scheduler if they will not have received their 11 hours of rest. Your normal process of doing this can take a day, eight hours. You put together a schedule. You text it out. You send it out over WhatsApp. You send it out over email. And then normally the responses come in. “I can’t work that day,” or “Hey, I’m already closing that night,” or “I need today off.” What you’re able to do here is press the button, and within about two or three minutes, the Deputy platform will look at all your employees, all those factors, and will actually fill those shifts, and you as a scheduling manager, of course you get the last say. This is not the machines are taking over. You as the scheduling manager will get a review of that schedule and then will have the option at that point to publish the schedule. I think probably, especially if you’re a business that has more than 15 or 20 employees in multiple locations, this is a feature that will enable you to make a lot fewer mistakes and speed up eight hours of a scheduling process to just a matter of a few minutes. Angelo Spinola: Okay. So we’ve got just a couple of other housekeeping matters on this that I’m going to cover quickly because we’re running a little late on time, so one is the notice and recordkeeping requirement, and just understand that there’s an obligation to maintain these schedules for three years and provide any of the schedules within the last three years to any employee that requests it. There’s also a notice requirement that you’ve got to post, which the Office of Labor Standards is supposed to put up on the website. Last I checked, it was not up there. If you are a subscriber to the franchise and clients toolkit, once that is posted we will have that on the toolkit as well. Derek, do you want to talk about how you maintain the schedule so that they’re available? Derek Jones: You got it. 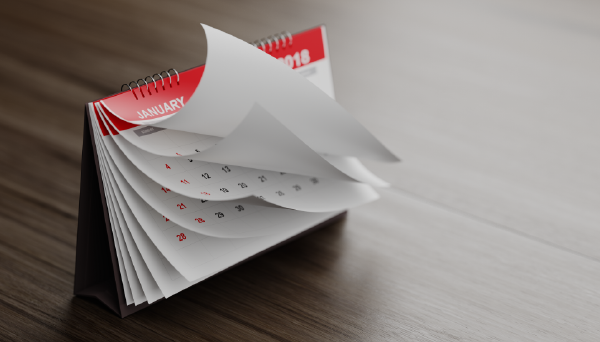 Just simply put, the mandate of the law is that you need to provide historical scheduling and timecard data, not only for a potential audit, but also at the employee’s request. They can request for historical information, so Deputy has a custom report builder. You kind of see the one dot here, the one’s a red dot. You’re able to pick any fields. You drag and drop those fields up into the top where the number two is, and then you’re able to actually just sort the columns, run the report, and you can send that to an employee. So imagine that you get that notice or Angelo’s more experienced here, but normally an auditor doesn’t give a whole month’s notice before they want to come in and come and check your business out, so in the event that you do get audited or there’s a suit, not only is the data stored, but you’re able to kind of quickly pull it and then … I think the key thing here is if the employee requests this information, you have it. When you don’t provide it, they might think you have something to hide, except you have it. It’s visible, and it’s stored for the period of time well beyond what the requirement requests. Angelo Spinola: One other point on that, because this is a new law that that recordkeeping requirement is new, so that’s on a going-forward basis as of November when the law goes into effect. It’s not as though you have to have those schedules going backwards. It’s taking care of themselves, not a terrible surprise. I will let you read those slides for yourself if you so choose. There’s also an anti-retaliation provision. I think we touched on this earlier, that you cannot take adverse action against somebody for exercising their right, say, by not accepting a shift offered within the zone of risk, within the 14-day period or calling out, those sorts of things. If they’re exercising rights under these laws, you cannot retaliate against them. If you do, it’s a $500 penalty for each violation, and if it’s a violation that results in a termination or adverse action that results in termination, that can go up to $2,500. We talked a little, too, about who’s going to be enforcing this. It’s going to be the Labor Standards Division. It’s administrative enforcement. This is an investigation that they can bring on their own or as a result of a complaint, and there is also a private right of action, and the four bullet points at the end describe where there can be a private right of action, which includes the schedule change premiums, which is where I think we’re going to see most of the action. These penalties are significant. [inaudible 01:20:21] on top of whatever actual premiums would be owed, any back wages owed, attorney’s fees, those sorts of things. There is also a $500 penalty per violation, so on each instance that there’s a violation. Example would be if a year from now we had 100 occasions where we shifted somebody … change their shift as a fast food employer within the 14-day period, that adds up to $50,000 in penalties alone. It’s per employee, per violation, which just highlights the requirement to make sure that you are really complying with these rules. Derek Jones: Great. We just covered a ton of ground. What the law is. Fast food and retailers. How to solve for it. I think what we’re going to ask Angelo to do now is kind of pivot into how to be and maintain compliance. And Angelo in the Littler group, it’s one of the reasons who Deputy has really chosen to partner with the Littler group is their, not only expertise in the law, but the resources that they can provide. It’s one thing to know about the law, but others to have resources. So we’ll turn it over to Angelo here. We’ve got about 10 more minutes to cover the ways to stay compliant, especially I think all businesses will be interested in these solutions, especially if you’re a franchise brand out there, there’s some great resources that you have. Angelo Spinola: So I’m going to cover this quickly. The first thing I want to talk about with a little more detail at the end of the [inaudible 01:22:01] I don’t know if we’re going to get to it, is that for those franchisees out there, franchisee systems or franchisors actually use this tool as well, we have something called the franchise compliance toolkit, which is chock full of a lot of the resources that we’re going to be talking about, including the arbitration agreements, and offer letters, and the postings and notices, [inaudible 01:22:23] all the stuff that you’ve got to do, and that actually is a free resource. That is something we do not charge for. We give it to our franchise clients for free. You can access it. It’s an online tool where you can download a lot of these materials that we’re going to be talking about. Lots of policies and New York specific stuff that you will need. The best way to deal with that, from my perspective, in addition to the compliance that we’ve talked about so far – adding the policies and materials, utilizing this kind of scheduling protocols, is with arbitration agreements, and what that is in a nutshell is if you have a valid arbitration agreement with a class action waiver, that means that your employee cannot pursue you in a class action. They can only pursue you on an individual basis, and that agreement is retroactive at the time it’s signed, so it applies to any claim that would be covered for their prior employment to their future employment with you. It’s a really, really great tool. We don’t have time to get into a lot of the details on arbitration. 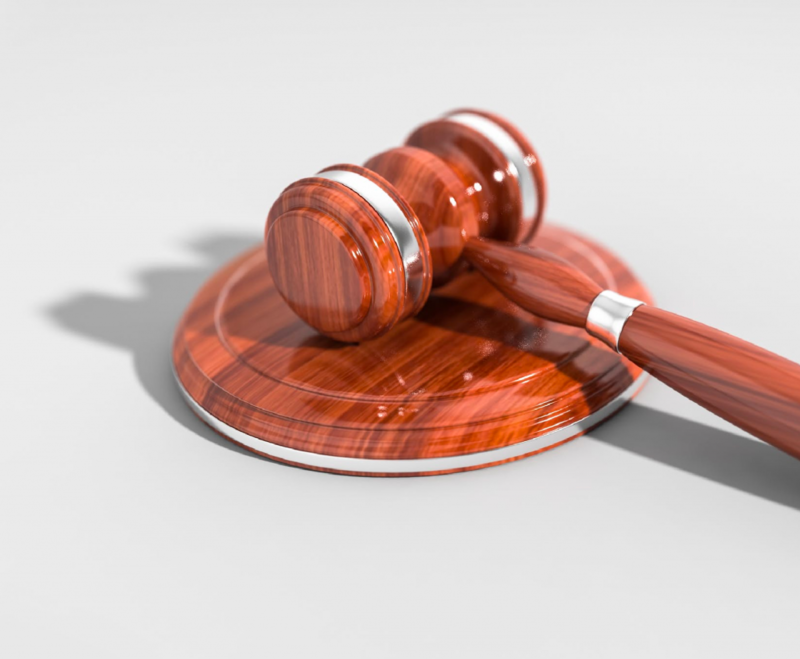 Understand that there’s some recent case law in New York that suggests that there’s a certain type of arbitration agreement you may need to use – the type that has a opt-out. The toolkit has that version on it that should work in New York, and there’s also some case law pending in the Supreme Court of the United States. Oral argument was just heard earlier this month, and we should get some decision related to mandatory arbitration agreements that you will see soon. You’ll see that decision come down, and that may allow you to use a more aggressive agreement, but the type that we use now should work nonetheless, even under existing state law. One other point is there’s a conflict between state law and federal law in New York right now as to what type of agreement works, so you’ve got to pay attention to that. In general, you need to also make sure that you understand what the other requirements are in New York. We’ve just covered kind of this new law, but there’s wage theft, there’s spread of hours, there’s show-up pay. You’ve got all kind of crazy requirement in New York that you’ve got to make sure that you’re complying with. One way of doing that, on our toolkit there a Littler on New York that basically covers all the New York labor laws. What you really need to make sure that you understand is what are your requirements at a local level, like New York City that’s got its own set of laws and rules, and you’ve got state law, and in some ways the state law may preempt or trump the city laws, but if state law doesn’t address it, which would be the case right now with respect to scheduling laws, then the city law would apply. So you’ve got three categories of law. Then you’ve got federal law. You’ve got to make sure that you’re in compliance with all of those, so it’s very, very important that you educate yourself. So Wage Theft Prevention act basically requires you to provide a form. It’s not hard to comply with. You just have to know what the expectations are, what the requirements are. That form is available to you on the toolkit along with tip credit forms, the New York City human rights notice, and the other posters that you’ve got to have up. That’s another area. You can also get those directly from the government. What’s important, though, is to make sure that you are focusing on your compliance. That’s going to be your best opportunity to avoid the kind of issues that we’re expecting to see. We’ve already seen that New York is a hot bed for wage hour litigation. The reason for that is there are all these complicated rules and laws, and they’re about to get more complicated, which is going to set off a whole ‘nother set of litigation, and your goal is really to make sure that you are separating yourself from the pack, and I think that this presentation has been a really great start. On that front, where you really understand what the requirements are, and now you need to take some steps to make sure that you’re complying with those requirements, and if you do that, you’re not going to be nearly the same target as these companies, and believe me, as Derek pointed out, there are a ton of companies that are unaware. We’re talking to them all the time. They do not know about these requirements, and that will be case even after the requirements come into place. So what you’re doing is separating yourself from those companies with better policies, better programs, better awareness, better training. It’s not impossible to do; you just have to think about how you’re going to do it, and make sure you do it. The building blocks are first the knowledge, understanding what the requirements are in the city, state and at a federal level, making sure you put your agreements in place, your arbitration agreement, your policies that relate to how you’re going to schedule how people are going to change shifts, what this grace period may be, and then make sure that you have top notch timekeeping processes. That is huge to have time to the minute, to be able to have accurate time records, which is a requirement. It’s a necessity for you to be able to demonstrate exactly how many hours your employees worked, what they were paid, how they were paid, that they were paid on time. It is one of the most significant issues that I see in my career is that we don’t have accurate time records, which means the employee gets the benefit of the doubt, and it becomes a real problem. Also make sure that your payroll systems can do the things that we’re talking about. That it can calculate the regular rate correctly for overtime purposes, that you can have separate line items for the different ways that folks are paid. That’s an issue that we see a lot of where there’s just issues there. Here are some general advice related to these particular rules. I think we’ve covered most of these, so I’m not going to review them again now, but you’ll have these slides available to you. Just make sure that you are training your managers in advance of what these requirements are and scheduling requirements, because that is your first line of defense, and if they’re not ready for this, the company’s not ready for it. Document, document, document. We talked a lot about the idea of making sure that you’ve got a system for establishing what it is that you’re doing, so when you’re challenged on it on why didn’t you pay a premium? “Oh, we didn’t paid a premium because employees were swapping shifts. Here’s the evidence of it.” Of what can you prove? What can we demonstrate? Also the point that I make on here is having a good grievance procedure. Opportunity for your employee to complain to you is huge. Make sure that they are aware and understand that you have an open-door policy. If they’re having an issue with anything, you want them to contact you and talk to you about it so that they’re not actually contacting the Department of Labor or the city or, worst of all, a plaintiff’s lawyer. I think we’ve talked training and how important it is, so I’m going to move on to the last point that I want to make, which is attestation and making sure … Derek’s talked a little bit about attestations and the idea of having employees certify certain things. You can also do attestation with their actual time, that they are certifying that they received their meal periods, that they are certifying that the hours that you have for them are all the hours that they’ve actually worked, that they haven’t worked outside of their punching. Next to arbitration, I think that employee attestation/certification of their actual time records is one of the greatest things you can do. Derek, I’m sure, will be happy to share that with you, what Deputy does there, but they’ve got some of the best attestation that I have seen of any system. We talked a little bit about the toolkit. It’s got onboarding resources, continuing employment resources, and end of employment resources. If you want to learn more about it or if you are a franchise who would like access to this, just give me a ring and we’ll get you set up. You sign a license agreement, and then you are off to the races. I think that is all I’ve got, so I don’t know that we have a ton of time for questions, but I know that we do have the opportunity for you to do a Q&A, so if you’ve had questions, we will be sure to follow up with you individually. Derek Jones: Great. I know we’re a couple of minutes over here, but there were a couple of questions that came up during the presentation. I’ll just lob these your way, and if you typed in your questions, we have those and we’ll follow up individually. One of the questions that came up heavy during the notice, Angelo, was the whole notion of posting in a conspicuous place. There were some questions around what if I … if I actually post the schedule and send it electronically to the employee, is that considered conspicuous, or is there also … do you actually need to print a piece of paper and put it up in the business if you are already kind of sending out schedules electronically through that method? Is the electronic method kind of conspicuous is what the question was getting at. Angelo Spinola: It’s a great question, and the answer is that’s an independent obligation, so in addition to circulating electronically, you also have to post it. It’s like old school New York loves their posters, so you’ve got to have it posted, and that’s another area where I would recommend having a policy because what is a conspicuous place? Again, sort of a vagary in the law, in other aspect of the law, that would be considered a break room, a time card, or a time punch where you know employees are going to be, but what you can do is have a policy that says we’re going to post this in this area and that area, and now in my opinion that becomes conspicuous even if it isn’t because they’ve got a policy that tells them where it is in addition to having the electronic version sent to them. Great question. Derek Jones: We’ll take one more, and then we’ll follow up kind of individually. There were a few questions … I’m not sure if this one came up during the retail or the fast food section, Angelo, so you’ll have to see if this is enough information to answer, but I think it came up during the discussion of the premium. If you offer a new shift, let’s say, with less than two weeks’ notice, the employer asks the employee to work directly, not through a trading of the shift, which we know can kind of potentially exempt that situation. If you get the employee so say, “Hey, I know that it’s being provided less that two weeks or less than five days or less than 72 hours, but I still want it anyway.” I think I’m kind of paraphrasing this question here, but even if the employee says, “Hey, I’m willing to work, and I don’t consider it a violation,” is that considered kind of written consent and you don’t have to pay the premium, or it doesn’t matter, or does it matter if the employee cares or not? You have to pay the premium no matter what if the schedule was changed or added? Angelo Spinola: Yeah, that’s one of these [inaudible 01:35:04] that I think is very frustrating that you’ve got to pay the premium if it occurs, even if the employee voluntarily agrees. You can’t even require the employee to do it if they don’t voluntarily agree to it, but the premium is due in all cases, and it’s not something that can be waived absent that employee swap situation, and it’s a lesser premium when you’re adding hours than it would be if you’re subtracting hours, but my view is that shouldn’t exist in the first place. Any time that somebody is voluntarily choosing to do something, I don’t see why you would pay a premium for that, and that is those premiums do apply to these fast food employers, and that is to the point … one last thing I want to say is, to the extent you are interested in starting, joining a coalition on this front, I do think there are things that we can do. There are things that we have done with respect to several other industries. I know that our New York office, our Manhattan office already has some ideas and some things underway with respect to these upcoming hearings and some preemption arguments basically trying to argue that this law is preempted by other law, so if that’s something that you would be interested in joining those efforts, or your franchisor would be interested in joining those efforts, please feel free to reach out to me on that because that is the type of thing that the more voices we can get on our side of this equation, the better opportunity we’re going to have to start righting some of these issues. Derek Jones: Excellent. We are definitely out of time at this point. I think we could continue going, but Angelo’s available. I’m available on the technology side. We’ll post a recorded transcript and a recording of the webinar on the Deputy blog within 24 hours. That’s at deputy.com/blog, and I’d like to thank Angelo and the Littler team for their preparation. Not only did they prepare slide and kind of dig into the law very quickly. As you know, since May this has just come up. They’ve also been in touch with the New York City council to help answer and clarify some of the questions as well, so thank you to the Littler team. Thank you, Angelo. If either one of us can be of any help for your business, please feel free to contact us. Have a great week. Angelo, any closing comments? Angelo Spinola: No. Thank you very much for your time. Sorry that you are having to deal with this, but believe me when I say that you are ahead of the curve compared to so many other folks that we’ve been talking to. Derek Jones: Absolutely. Great. With that, we’ll conclude the webinar. Thank you everybody. Have a great rest of the week. 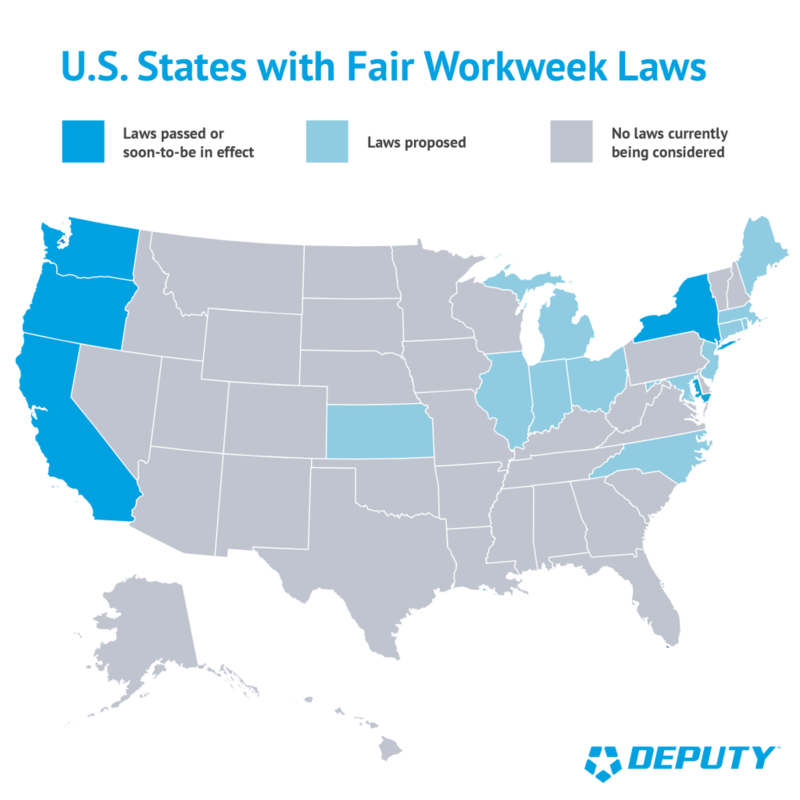 The post The NYC Predictive Fair Work Week Regulation – How to Comply & Avoid Harsh Penalties appeared first on Deputy.